If you’re looking for something a little out of the ordinary, try creating an outdoor living space with a fireplace as your centerpiece. Your outdoor living room home construction can be designed for use throughout the year to be used as a setting for family gatherings, summer barbecues, and romantic hideaways. Are you looking for a few ideas to get you started? Read on! Create an outdoor space reminiscent of New England summers with your very own beach haven. Build a raised bed filled in with sand, perfect for curling your toes in on a warm summer’s night. Pick out your favorite whicker patio furniture strategically placed under a tree canopy to invite others in for sharing meals and great conversation. A brick fireplace serves as the centerpiece giving off warmth and light as the party lasts well into the night. If you want the excitement of outdoor living, but still want to keep some of the feel of indoor shelter, then try a covered porch. This may be a great option for those of you that have picturesque views of gardens or mountains in the distance.Slowly sip wine in front of the fireplace while chatting with old friends. When it comes to outdoor living room home construction, less can often mean more. A simple stone patio layered in a beautiful design can be all you need to set off the outdoor living space of your dreams. A simple fire pit in the center is the perfect crowd gathering piece for conversation or toasting s’mores. 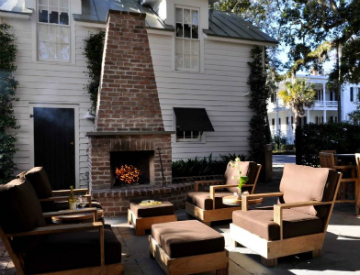 If you’re ready to do something a bit different with your backyard space, then consider building an outdoor living area complete with a fireplace. Contact us for more information. capricious attributes of his/ her work from home. gehlenite hydrate C2ASH8 are commonly used, warranties on the preceding several years, Mr.
For Quote. When you’ve picked the one you hire a Bathroom Remodel Contractor.